times 2. Yesterday was my birthday - 36! I have a twin sister who will vehemently insist to anyone who might even suggest different that she is NOT old. (Seriously people, don't even joke about it with that one) So, it only makes since that if my twin sister is not old then certainly I too, am not old - correct? She has the right idea and I am inspired by her healthy attitude even though it would seem I am poking fun at her. It was a really nice birthday - gorgeous weather, lunch with Peter at his school, some crafting time, a trip to a huge antique store, date night with Vince - dinner AND a movie! Not too shabby at all. We saw Inglorius Basterds which we both thought was a little more violent than we anticipated (And we anticipated a whole lot of violence) but still extremely entertaining. You have to admit the premise is kind of a sure shot - who doesn't want to see the nazis get what's coming to them? But onto more pleasant things. Here are two more ornaments I posted this week. We sort of have a thing for squirrels in our house (especially Vince!) so it was only a matter of time before one or two scampered into a craft project. 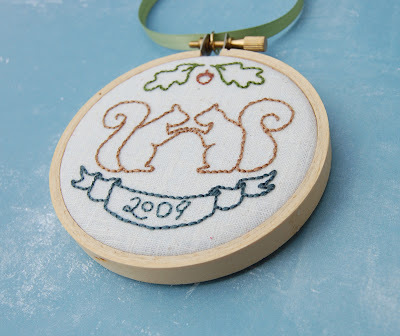 I've got a few more ornament ideas that I need to work out and I would love to make a couple of calendars this week as well. (crossing fingers). Happy birthday, my dear--to you AND your younger twin. ;-) And I LOVE the baby shoes! happy birthday!!! i love all your embroidery work!! Happy Birthday to you Sister September Birthday Gal!! You and your twin ARE young!!!!! Happy Birthday!! 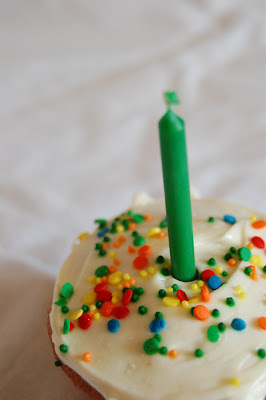 I turned 44 last week, and I'm not remotely anywhere near "old" (ssshhhh, don't tell my knees because they'd disagree! ), so you definitely are still very YOUNG :). We'd like to see Inglorius Basterds, so I'm glad to hear it's entertaining, in spite of the violence. Love the ornaments (tho my brain refuses to even think "holidays" -- it's still too hot). 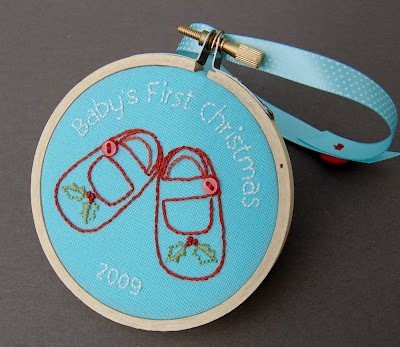 I finished an embroidery project last week that I stitched on turquoise fabric and, boy, does it lend itself well to being stitched on -- just a beautiful background, much like your Baby's First Christmas ornament. I love the baby ornament. is that a pattern you sell?? I have a baby that 'needs' one of those!! Happy birthday! Those ornaments are really cute! Hey Corinne, the hubbers and I had a belated anniversary movie date yesterday and saw Inglourious Basterds -- thanks for mentioning it. We thought it was quite entertaining, tho the violent parts had him looking away as much as I did! Brad Pitt completely cracked us up, tho I thought the character of Landa was the most enetertaining.